It's revolutionary! It's simple! It's the way to go! 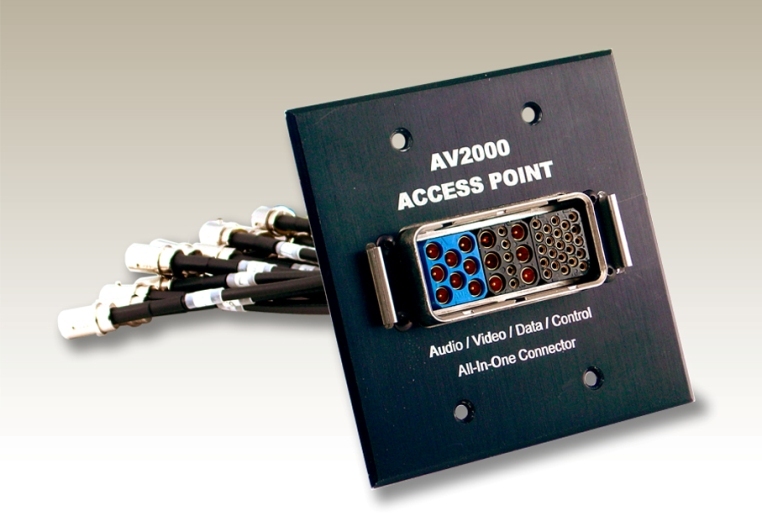 AV2000, only from Wireworks, combines audio, video, data and control signal cables in just one single connector using true coaxial contacts and full 16 gauge contacts! Now you can relax, knowing that your audio/video system has the interconnect system that allows it to be disconnected and reconnected safely and simply whenever you wish. No one should have to be faced with a bewildering array of connectors on flimsy tails, all of which have to be reconnected correctly every time they move their system. With AV2000 there is a single, easy to use connector that is designed to prevent costly and time wasting mistakes that always occur with any alternative interconnect method and AV2000 can be perfectly suited to any system. Imagine this: your smart A/V lectern can now be truly portable without any concerns about untrained personnel being confused when the wide variety of signal cables have to be re-connected to a wall plate or floor box. AV2000 Multi-Media cabling gives you complete assemblies with just one robust connector. Plug it in and the job is done! It's tough too! No more concerns about your cables being susceptible to damage. AV2000 provides strength, durability and simplicity all in one easy and attractive assembly solution.